I love the Fall season. The colors, the leaves on the trees, the smells in the air... craft shows start springing up, weather cools down. Love everything about it! This new tin has a Fall feel to it. I am looking forward to doing a few more pieces using this pattern. I was hoping to get some earrings done last night to match this bracelet, but time got away from me. Maybe tonight? I did have a tough time photographing this, due to the color. The tin is black and just shiny enough to give a glare in the photographs. Dang it. Did the best I could. Hope you are enjoying the season so far! I know I have to slow down and enjoy it before it's gone for another year. You always do such a great job capturing your pieces to film. I love this, how exactly do you do this? I am sad to see summer go, but I do love all of the fall colors. This is a really lovely piece. man- i love how there's something new here every single day. And it's always something so eye-candy-licious. You provide quite a service to my muse. 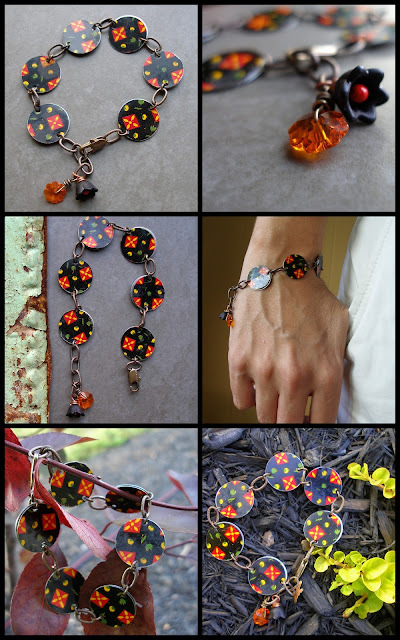 Beautiful crisp fall colours in your bracelet! Hey know what? Im having a Give~away! Come see! Very nice, Lorelei! I love the new collection! What's all this you say about Autumn? We're just now in the low 90s here in Nort Texas! It won't feel like Fall until late October. I love what you do with the tins -- your style is so distinctive and "carefree" feeling. Love it. Beautiful. I am always sad to see the summer leave us behind but I do always enjoy Autumn as well. Loving the outdoors pictures! They look great - very atmospheric.